Hunting with golden eagles (Aquila chrysaetos) is a traditional art of the Eurasian steppes, particularly defined as “Horse Riding Falconry” or “The Eagle Falconry” in Central Asia. It is a type of falconry. In 936-45 AD the Khitans, a nomadic people from Manchuria, conquered part of north China. In 960 AD China was conquered by the Song dynasty. From its beginnings, the Song dynasty was unable to completely control the Khitan who had already assimilated much of Chinese culture. Throughout its 300-year rule of China, the Song had to pay tribute to the Khitan to keep them from conquering additional Song territory. Despite the fact that the Khitans assimilated Chinese culture, they retained many nomadic traditions, including eagle hunting (see the unknown Chinese painting from Song dynasty). Kazakhs (Altaic Kazakhs or Altai-Kazakhs) living in Bayan-Ölgii Province of Mongolia continue to hunt with eagles today. 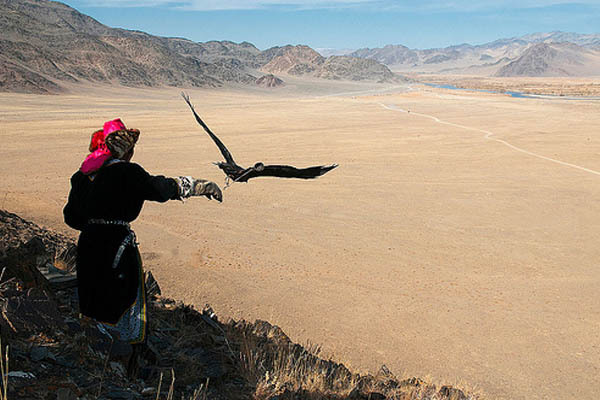 There are an estimated 250 eagle hunters in the Western Mongolian province. Their falconry custom, so-called ‘horse-riding eagle falconry’, is unique in practice only with trained Golden Eagle (Aquila chrysaetos daphanea) on horseback. Their hunting target is almost limited to Red Fox (Vulpes vulpes) or Corsac Fox (Vulpes corsac). In the first week of October, 70 eagle hunters gather for the annual Golden Eagle Festival of Mongolia. They use eagles to hunt foxes and hare during the cold winter months when it is easier to see the gold colored foxes against the snow.